Blepharospasm is a disorder characterized by ptosis (inability to raise the eyelids), and is often accompanied by spasm and tight closure of the eyelids. Its cause is unknown, and it may be present from birth or develop later, leaving some sufferers functionally blind, despite having normal eyes! Botox® injection can relieve the spasms, but many patients remain unable to open their eyes or keep them open. Functional electrical stimulation (FES) of the levator palpebrae superioris muscle (LPS) raising the eyelid 3-4 mm would provide these patients with useful vision. Surgical elevation of the upper lid is the current treatment, but such static repositioning is less desirable, both functionally and cosmetically, than the programmable coordinated binocular elevation possible with FES. FES of oculorotary muscles is technically more difficult. Patients suffering from paretic strabismus (misaligned eyes or gaze limitations) could be rehabilitated by FES of an extraocular muscle (EOM). Current treatment is compensatory impairment (surgical or pharmacological) of another, perhaps normal, EOM. The signal for controlling stimulation of a paretic muscle could be derived by monitoring the intact innervation of the antagonist muscle (the opposing muscle in the same eye), with which it normally has reciprocal relationship. Stimulus drivers approved for other medical applications would be suitable to connect directly to electrodes we have developed. There have been several studies showing feasibility of electrical stimulation of eye muscles. Otto et al (1986) and Somia et al (2001) studied the orbicularis oculi in dogs, and Tobey & Sutton (1977), Otto (1997), and Sachs et al (2007) in rabbits. These studies produced closure of the eyelids, useful, eg, in N7 paralysis, and suggest that clinically useful stimulation of muscles in and around the eye is practical. It has also been shown in many muscle systems that FES increases muscle size, normalizes paretic muscles themselves, and tends to promote normalizing reinnervation, suggesting that FES of limited duration would be clinically useful. 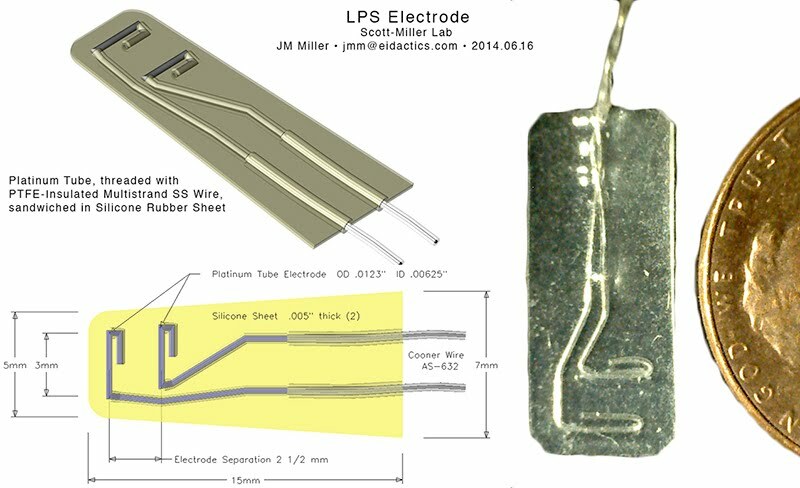 EOMs and the LPS are much smaller than the orbicularis oculi, requiring much smaller electrodes, and we have designed unique, durable, biocompatible electrodes to fit these muscles. Our current efforts, focusing on LPS stimulation, are to refine stimulation parameters, and evaluate long-term stimulation safety and effectiveness, including tissue tolerance and durability of implanted devices. Chronic muscle stimulation electrodes must be effective, robust in a corrosive, dynamic environment, and biocompatible. Many designs were tested to develop a silicone pad carrying fine, cylindrical platinum electrodes (each ~3 mm long, separated by 2.5 mm), mechanically bonded to Teflon-covered multi-strand stainless steel wire leads. The flexible silicone pad is 1.0 mm thick, extends forward and is sufficiently stiff to be securely sutured to the levator at a position determined by delivering test stimuli during surgery. After a few weeks, connective tissue anchors electrodes firmly in place, and none have migrated or required removal because of tissue reaction. The levator muscle in rabbit is very similar to that in humans. Here we see a rabbit shortly after electrode implantation, 3 weeks later, and 1 year later. It can be seen that effectiveness is maintained over time, and no discomfort is apparent. Scott AB, Miller JM, Danh KK (2015). Electrical stimulation of nerves to the levator and oculorotary muscles. In: Transactions of the ISA 2014.